The Fukuoka Prefecture Police have become the first in Japan to offer cash rewards to anyone who reports finding a hand grenade, called “pineapples” in yakuza slang. A long-running gang war in the prefecture has raised public fear in the area, and the handy hand-grenade has increasingly become the weapon of choice amongst rival gang members. As Japan has put into place increasingly harsher laws regulating the actions of the Japanese mafia, aka the yakuza, forcing many out of business–the remaining thugs are fighting viciously over what’s left of the pie. Fukuoka Prefecture is located in Southern Japan also known as Kyushu, which is home to five major yakuza groups with a total of roughly 3,000 members. Kyushu has been plagued by violent gang wars for nearly five years. The first violent conflict began in August 2007, when Yoshihisa Onaka, head of the Kurume City-based Dojinkai, was assassinated by a shooter from a rival gang, the Kyushu Seidokai. In addition to inter-gang warfare, as the police have cracked down on organized crime in the last two years, local organized crime groups have reacted violently to efforts to curtail their economic activities. When gang members aren’t lobbing grenades or shooting at each other, they are shooting at the offices of companies trying to cut organized crime Last year, on Nov. 26, Toshihiro Uchino, the 72 year old president of Hakushin Construction –which was trying to cut ties to local gangs—was shot to death outside his home in Kitakyushu. “Pineapples” are not only deadly for ordinary citizens, they’re deadly for the yakuza handling them as well. Last April, two members of the Dojinkai, while driving in a car on a suicide mission to attack the Kyushu Seido-kai headquarters, managed to blow themselves up first. It is unclear whether the hand grenade went off before or after they drove into an electric pole on the side of the road, totaling the car, which reportedly burst into flames. It is also unclear whether this accident spurred enrollment in hand grenade safety handling courses for the yakuza but the incident certainly left an impact on the gangster community. From 6 criminal incidents involving hand grenades in the Fukuoka prefecture last year, for the first time in Japanese history, the Fukuoka police announced recently that as of April 2, there will be a 100,000 yen ($1200) cash reward to anyone who reports any suspect in possession of a hand grenade, according to the Yomiuri Online. If the report leads to the arrest of the owner, or to the seizure of the hand grenades, the informant would receive 100,000 yen for each grenade. If the owner of the hand grenade happens to be a gang boss, the reward would be higher accordingly, the police announcement says. The police would also pick up information from anonymous informants. 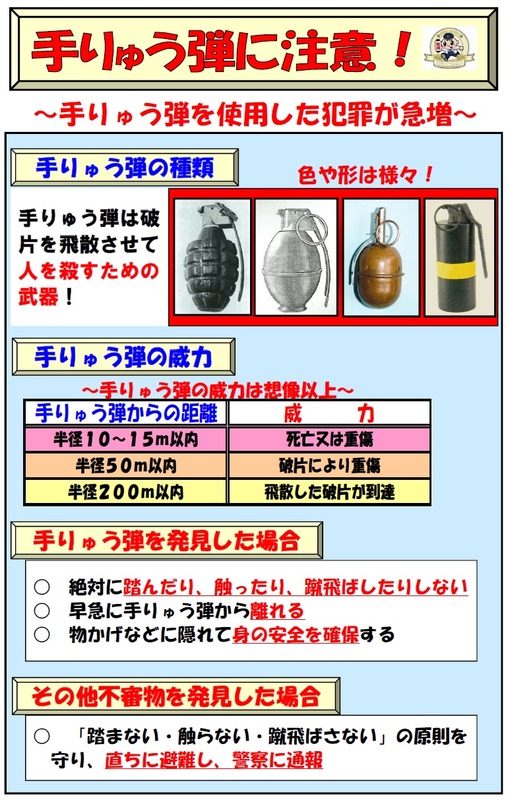 Last year, the Fukuoka Prefectural Police have released a large warning message on their homepage about a recent rise in crimes committed with hand grenades. Although we think of Japan as a place without guns, there are a few gun related crimes every once in a while. “ Do not step on it, touch it, or throw it. Get away from it as quickly as possible. The Japan Times reported in 2008, that in Kurume, Fukuoka prefecture, two years of gang war in the region has caused “seven deaths and more than 20 shootings and bombings.” In a great act of collective courage, 1,500 residents of Kurume decided to take the yakuza gangs to court to close down their offices. “The yakuza are using weapons like the kind you see in the Iraq war: grenades, bombs and guns that can shoot people from 500 meters away,” the lawyer of the plaintiffs said. On April 10th 2011, two people were killed, and 12 people were injured in the middle of the night in the city of Omuta, Fukuoka prefecture, as a result of a hand grenade explosion that occurred inside a car. In May 2011, a nine-year old child found a hand grenade in a rice field in Iizuka, Fukuoka prefecture, and took it home to the astonishment of his father, who handed the object to the local police station 2 hours after he discovered it. According to the police, there were no yakuza gang headquarters where the grenade was found. Pineapple was also a common term for grenades among WWII & Korean war veteran fathers when I was growing up in California. The term obviously comes from the shape of US WWII era grenades. I don’t know how common it was among veterans in other parts of the US of if it was regional jargon. I though it was common knowledge that pineapple mean grenade in slang. Guess not? Previous Previous post: A Light In The Dark Empire: The Man Who Fought TEPCO.